PRESS RELEASE: Roland is pleased to announce that its popular AX-Synth Shoulder Synthesizer is now available in a premium black sparkle finish. The new glass-particle UV finish reacts to various lighting conditions, creating a glistening appearance that is striking under stage lighting. The AX-Synth remains available in the standard white finish as well. Created with the art of performance in mind, the AX-Synth allows keyboardists to connect with their audience as guitarists and singers do. It represents Roland's new generation of remote keyboards, offering an onboard sound engine that features a collection of the company's best cutting-edge synth sounds. When wearing the battery-powered AX-Synth, keyboardists can escape their standard stationary rig and create kinetic musical performances, moving freely around the stage. The ribbon controller, mod bar, D BEAM, and assignable knobs give players the ability to perform memorable and expressive solos with the ultimate real time control. The AX-Synth features 49 velocity-sensitive keys, and is the first shoulder keyboard to include a 128-voice polyphonic sound engine with 256 distinct tones accessible from eight bank buttons. 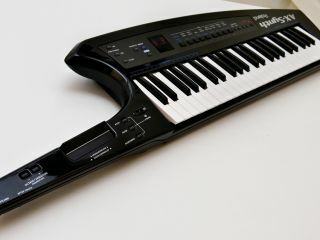 It can also send and receive standard MIDI messages for use with other keyboards or sound modules. The AX-Synth includes a dedicated V-LINK button to control visual elements, and a dedicated PC software editor/librarian application is available for download for players who would like to customize their own sounds. The AX-Synth with black sparkle finish is expected to be available in November with an MSRP of $1,449.00.